From there, faced with these large frescoes, the feeling of the past being wiped away, of its disappearing and the impression of ruins: of traces of a world that is now based on a bombardment of images. For those of us, New Yorkers, who lived through 9/11 and for the rest of the world who lived through the “bombardment of images”; for those of us who have been left empty by the cinematic dramatizations, documentaries and photographic images; for those of us who still have a void visually and emotionally when we approach the New York skyline today: it is the poetic movement of the city that has pulled us through to the other side, to life, to living. And it is the strength of the genre of experimental filmmaking that allows the poetic filmmaker the freedom to visualize his or her imagination – a freedom that can produce a subconscious experience through the eye of the spectator. In the case of Viviane Vagh’s Ground Zero, New York, 2005 (2007-8), for a moment images materialize a healing world capable of contributing to a memorializing process that ends a collective period of mourning. It is through this perspective that I viewed and interpreted Viviane Vagh’s visual experience. Vagh’s short film, approximately 10 minutes long, in both colour and in black and white, engages with the elements of time past and present, of distant observation, of memory and of movement. In a sense, Vagh picks up Alain Resnais’ earlier legacy of camera movement and editing with an ability to represent the inner workings of human memory that are provoked by the filmmaker visualizing in the present. Vagh has painted with impressionistic strokes a voyage in and through a time present but which co-exists with the traces of a past event that have not yet been “wiped away”. 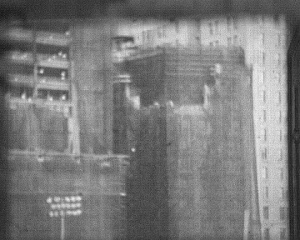 Rather, in Vagh’s film, it is an event that lives in the blurred images of an excavated Ground Zero seen at a distance, through windows, screens, barriers, distancing us from the too-painful reality, while making the absence of the two towers and the absence of lives always present. In my viewing of the film, I divided the film into three moments, all of which crystallized and created metaphorically three stages of a city and its inhabitants’ process of working through a trauma. The film opens in colour, faded by Vagh’s nostalgic lens. The spectator enters the film moving forward with the camera, but image and time are interrupted momentarily with staccato cuts of still images of Manhattan buildings, all to the sound of an incessant ticking clock. There is nervousness and energy in this opening, like the city itself, which moves through views of Manhattan from above, from the rooftops – a view, when experienced in reality, brings a certain sense of space and peace from the constant movement and tension of the city below. However, in this opening sequence, with the nervous clock and the jump cuts, Vagh gives us a sense of unsettling anticipation within the precarious calm of the panoramic views. The city, in its entirety, can be only fully integrated in one’s eye, if it is seen from above, high up, before one descends into the deep canyons and crevices of its streets, where the inhabitants in constant motion run the length of its long avenues like a rushing river. Vagh’s camera moves in this same manner – like an urban pedestrian – meandering, quickening at times, slowing down, as it glides along buildings and fire escapes. This motion stops, at moments, with flashes of the still images, as if to seize and stop time as a warning that an instant will happen, an instant that will be a moment out of time – a moment caught … still … that defines the point where, in the past, all that we thought of as reality, as possibilities, will forever be fractured. At the end of this sequence, Vagh builds to a climax, rhythmically, to the point where the alarm finally goes off, marking the moment where everything changed. The camera is in the street at this moment, so we have descended into the life of the city, awakened by the alarm that has disturbed our lull of the visions of a horizon from the rooftop. We move in the streets, now, with the workers, the crowds of the city, anonymous but not alone. We stop and gaze at a shop window on a street corner. Our eye wanders up and the down the buildings, past the perpetual traffic. Nevertheless, the world is about to change. This moment of crisis is subtly memorialized in a vision of a bouquet of white roses, a flash of the future, superimposed next to a worker who has started his day, unaware of what this day will bring – as we all started our gleaming, sunny Tuesday morning, seven years ago. Vagh fades to black at this moment, time and the world, as we know it, have stopped. It is at this point that we enter into the second part of the film – a journey in black and white to Ground Zero. The spectator is led into a process of mourning, of distant observation and of memorializing. Through the solemn organ music, composed by Jonathan Levine and the use of black and white, an element that visually places the experience into a more distant past, Vagh carries us on a path through our loss and brings us to the other side. Through blurred images of hand drawn pictorial memorials created by the children of the victims of 9/11, Vagh leads us through the most painful moments of the reality of loss – loss of fathers, mothers, sons and daughters. The close-up of the children’s drawings are hazy, as if it would be too difficult and too invasive to look at them directly, with clear eyes – better to gaze in a dream-like state. The words of these longing children wash over us painfully – “I remember riding on Daddy’s shoulders.” They are the living victims of this tragedy – living forever with loss. The sequence is also haunted particularly by the image of the former Deutsche Bank building, severely damaged in 9/11 and for years covered in what resembled a black burial shroud. Its presence in the film reminds one of the mysterious black monolith in Stanley Kubrick’s 2001: A Space Odyssey (1968) and, in a sense, it serves a similar metaphoric purpose in Vagh’s film: a presence that initiates an evolution, in this case, an evolution out of mourning and back to the movement and humanity of New York. The camera studies this ghost-like building, travelling vertically and horizontally, but again, filmed through diffusing windows and screens. There is a series of metal bars through which we see absence. These visual obstructions give us a sense of imprisonment – as if we are imprisoned by the inability to reach beyond the bars and touch the last remnants of the past. 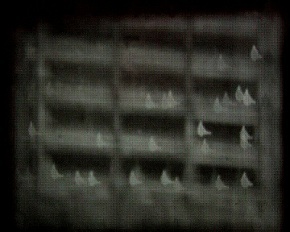 Vagh helps us to find a sense of closure, however, through a final vision, as she zooms in as close as possible, within the restrictions of the window panes and the bars, to focus on what appears as small white triangular lights … white doves that rise with the shrouded building in an image that memorializes spirit, hope and light – light that were once lives. Youssef Ishaghpour, Le Monde comme images (Farrago, 2003). Cited from the exhibition “Dennis Hopper et le Nouvel Hollywood”, Cinémathèque Française, Paris, December 2008. T. S. Eliot, “Burnt Norton”, in Four Quartets (London: Faber & Faber, 1979 ). Diana Gonzalez has a Doctorate from EHESS, Paris.